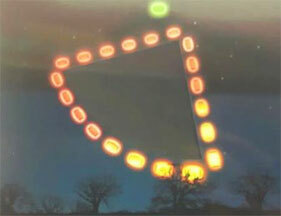 Computer-generated illustration of pyramid-shaped craft surrounded by red lights that would brighten on the right side to whitish-yellow-orange. The green sphere was seen shooting out of the top of the pyramid. CGI illustration © SUFON - All Rights Reserved. Subscribe now to read this report.